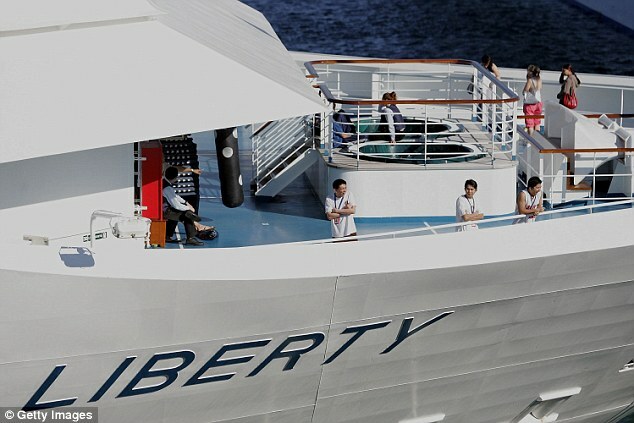 CHARLOTTE AMALIE – The Carnival Liberty’s own shipboard sprinkler system extinguished a fire aboard the vessel while it was docked in the St. Thomas harbor, the Virgin Islands Free Press has learned. The fire was first reported at 11:30 a.m. Monday in the engine room of the ship. Coast Guard officials said the ship was moored when the fire sparked, so everyone still aboard the ship was able to evacuate quickly. The cruise is on the second day of a seven-day Caribbean cruise that departed Sunday from San Juan, Puerto Rico. The ship was evacuated and there were no injuries. Carnival said the ship’s guests were taken to a hotel in St. Thomas, where they stayed in a reception area. Around 8 p.m. Monday, the Coast Guard gave permission for the passengers to reboard the ship, Carnival said. The fire was extinguished by the ship’s sprinkler system and people were allowed back on board Monday evening. Carnival Cruise Lines said it provided free shuttle service to destinations on St. Thomas and gave passengers a $150 shipboard credit. The company said a team of experts was working to assess the engine while the ship remained in St. Thomas on Tuesday. An assessment is expected to be finished this morning, Carnival said. 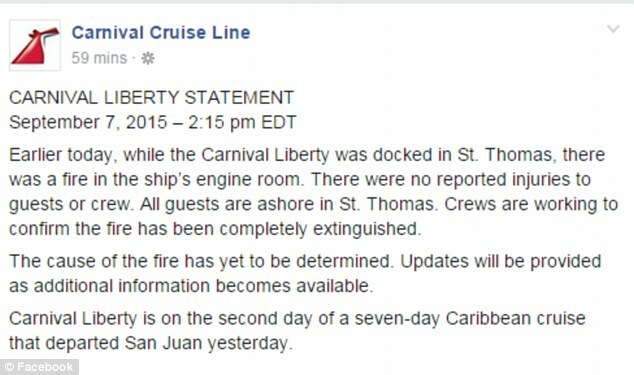 Carnival said it has not been determined when the ship will depart from St. Thomas. In July, a fire broke out on Royal Caribbean International’s Freedom of the Seas as it pulled into Falmouth, Jamaica. No passengers were hurt, but one crew member suffered first-degree burns.